Summertime Fishing on Sanibel & Captiva Islands! 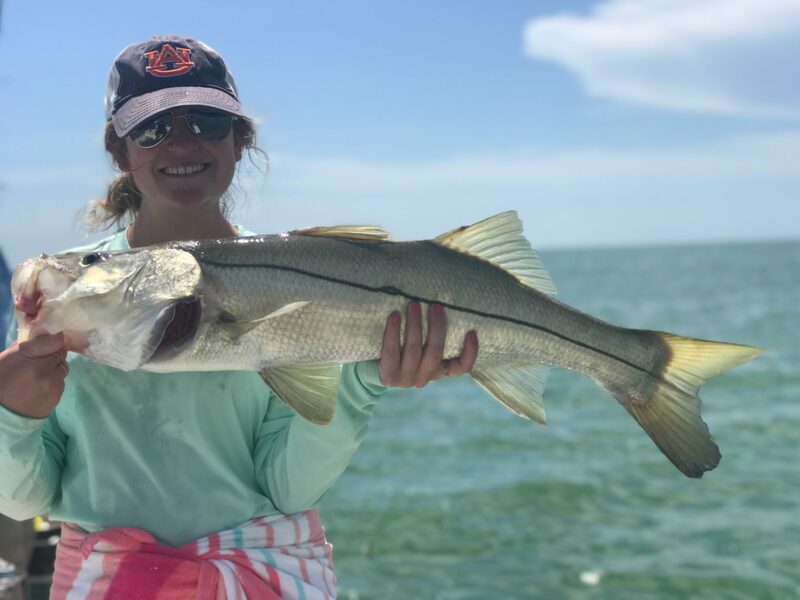 Summertime is in full swing on Sanibel & Captiva! Warm waters, mild breezes, afternoon thundershowers and plenty of fish to pull on the other end of the line! We see a lot of summer family vacations during this time of year. The kids are out of school; people are ready to soak up some sun and kick back to enjoy everything the islands have to offer! Sanibel & Captiva never disappoint! 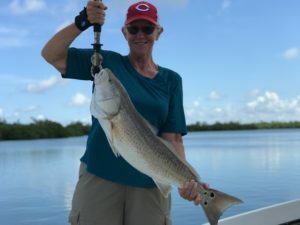 July offers great fishing in SWFL! 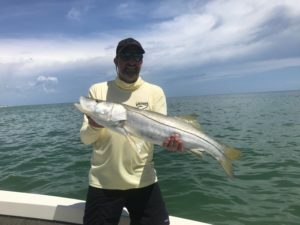 July is the peak of the Snook spawn on the beaches of Sanibel & Captiva, and this year has not let us down. The big girls have been plentiful on the beaches and in the passes! 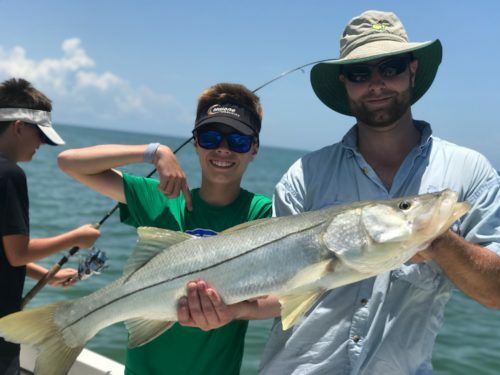 Look for Snook to be holding in the shadows around structure or in the trough that runs the length of our beaches. Live pinfish, grunts and croakers will entice these beasts as will a host of artificial baits like a Mirrolure or a Yo-Zuri! The trophy fish are here, so get out there and wet a line. 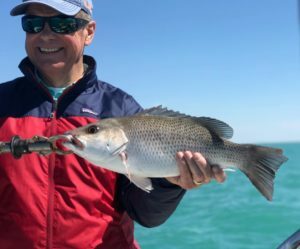 Speckled Sea Trout are plentiful on the flats and are more than happy to eat a jig or live baits on the flats. Look for them around the lush sea grass beds and potholes in 4-6 feet of water. Mackerel are also holding strong and can be caught with spoons and live baits along the sand bars and on the flats. Shrimp, pinfish and shiners are our go to baits for both species this time of year. Mangrove Snapper (or Mang’s) are also moving inshore during this time of year! Mangrove Snapper are voracious feeders and are more than willing to eat live shiners. They make excellent table fare and are generally plentiful if you know where to find them. “Mangs” are, in my opinion, some of the tastiest fish in the gulf! I’ll have to put together a catch and cook on these guys this summer! If your looking for a trophy, there are still Tarpon around the islands but they aren’t quite as plentiful as they were a month ago. That said, if you know where to look they will still dance for you. They are working their way up the gulf coast as the waters warm, but they will return in a few short months. Sharks however are plentiful! In just the last few weeks we’ve caught a number of Hammerheads, Black Tips, Spinners, Nurse, Bulls and even a 7+ft Lemon Shark! If you want to get on one of these monsters, now would be a good time! Big pieces of cut bait, pinned to the bottom will lure them in…the fresher, the better!!! I’ve been fielding a number of questions from people who want to fish, but are afraid to with all the well-publicized water quality issues that have been on the news. Don’t be!!! Thankfully, many of these issues have been contained to areas to our East and North. That’s not to say they don’t effect us here on Captiva…. However, we’ve definitely been spared the brunt of it. I won’t go into the politics behind it all…but I agree that something needs to be done, NOW. The water and the beaches are what draws millions to our area every year. Something must be done. Come on down and keep fishing!